'Know Thy Tools'? Why would I want to know my tools when there's a lifetime's worth of instant gratification to be had from VST preset flipping? You don't have to learn what all those knobs on a plug-in do, yet end up with an aural aesthete's appreciation of sound. Well just hold on there. One of the latest kids on the Minimoog emulation block is Native Instruments Monark and Al Swettenham over at Groove 3 has made it his mission to force your fingers onto aforementioned knobs until you've learned 'em good. Al is from the Union Jack side of the pond, but has a clear voice so I doubt Americans will have difficulty understanding the accompanying audio. I recognise his voice from other Groove 3 videos and the training company is right to ask him back since, after a couple of vids, it's clear he's going to make the effort to explain things clearly. One thing I do like is that Al is not afraid to grumble about things he finds exasperating, so this series doesn't sound like a slick product ad - you get a feeling that there's honest advice here. As for the subject matter, I went into the videos thinking 'let's see if someone like me can learn anything at all'. 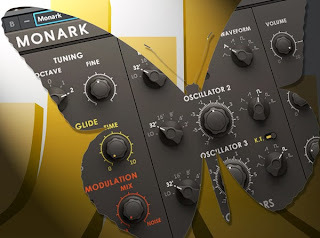 I've been using and programming VSTs for a good few years and, let's face it, Monark is an emulation of a Minimoog, the big Grandaddy of subtractive synths, and is not exactly brimming with extra features. Mr Swettenham appreciates this and goes into 'every button explained' detail, along with how this dial over here will affect that dial over there. Useful, given that there aren't that many buttons and the Minimoog already has a wealth of users knowing the tweaks and tricks. Al does well to incorporate their lore into the videos. 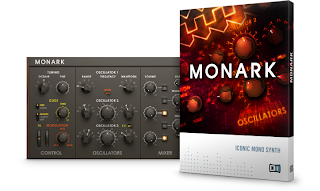 All subtractive synths, virtual or otherwise, follow a similar set of principles (oscillators, filters, envelopes, etcetera) to those of the Minimoog and the series serves as a solid introduction. It's short enough to not get boring and the limited feature set of the instrument means that Al can go into depth, such as illustrating clearly how a filter can be driven into self oscillation. I haven't seen anyone else do this up until now and I found myself wondering why not. It does beg the question as to why a complete newbie would be sitting down with an expensive and specialised monophonic instrument like Monark in the first place. But, either for an intro to subtractive synthesis, or as a consolidation of various bits of knowledge already gleaned, Monark Explained works very well. The format of the vids is what I've come to expect; a breakdown of individual parts and then a section about how to make various sounds. It's my preferred way of learning because you get synthesis smarts tied to sounds. It's perhaps inevitable that the sound-creation sections are going to be more fun than the detailed stuff and I'd like to have seen a little of it mixed into the explanations of the different sections. Monark is a simple synth, but one that deserves some digging into and Al clearly has enough knowledge of the product to do so. In fact, because Monark's architecture is so simple compared to most VSTs these days, you have to know it well to tap into its potential. That's true of many soft synths, but more so in this case. I'd recommend these videos for people who have scant knowledge of subtractive synthesis; people who have heard the phrase 'self-oscillating resonant filter' and have sat at the back of the class too scared to express bafflement. *Groove 3 Monark Explained is on offer at $20 ($25 reg) for the download version.